Q: Every book has its own story about how it came to be conceived and written as it did. How did A Demon In Silver evolve? A: It actually sprang from an idea for a totally different novel. I came up with a concept set in the modern day, featuring warring gods who had fought one another through the ages. They were known by different names in different cultures throughout time, but were now on the brink of extinction. I canned the idea as it was obviously very close to Gaiman’s American Gods, but the concept of warring gods stayed with me. When I later got to thinking about a fantasy realm that had once been ruled by magic but now there was none, the two ideas kind of evolved into the War of the Archons series. Q: I really enjoyed the way you constructed A Demon In Silver as essentially a chase narrative, introducing many important characters only as they become involved in the pursuit of Livia. I was also impressed with how you wound the plot back around to the beginning of your narrative, closing the circle, as it were, even as you left room for lots more to come. What inspired you to structure the story in these non-traditional ways? A: I don’t really like rules, would be the quick answer. Basically, some of the plot reveals required a non-linear plot structure for a bigger impact. But I think the story bounces along fast enough so as not to ruin the pacing and plot. A: Readers of fantasy have become much more diverse in recent years, which is reflected in the wide array of fantasy that’s currently available. Aiming at a particular demographic only limits your readership so I don’t tend to write for any one perceived group. I think the best a writer can do is produce the kind of novel they’d like to read, then you just have to set in free and hope other people like it too. A: I’ve read and admired a lot of novels over the years. I think the one that made me sit up and take notice the most was The Blade Itself by Joe Abercrombie. On the face of it the story has been told a dozen times before, but it casts aside all the old tropes to become its very own thing. And I don’t think I’d ever laughed out loud that much at any novel I’d read before. A: Practice, practice, practice. I’m a great believer in learning on the job, and writing novels (or anything for that matter) requires that you put in the hard hours. I wrote around five novels before I had a word published. 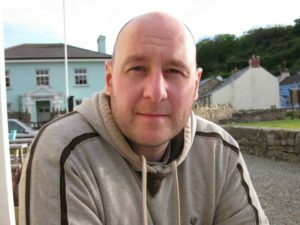 The process of writing a novel from start to finish, even if it turns out to be horrendous, is more valuable than any creative writing course you could go on. That’s not to say those things aren’t valuable, but finding your own ‘voice’ as a writer is the key to success. Q: Do you adhere to any particular writing regimen? A: I find myself easily distracted, so I subscribe to a very strict regimen. I tend to cut my chapter plans down into bite-size pieces and go at them in short sprints. Then I’ll go back through in one session revising the huge mess I’ve just made. Q: In the acknowledgments to A Demon In Silver, you talk about the changes you had to make to the novel as plotted. Do you generally consider yourself a plotter or a pantser (someone who writes by the seat of their pants)? A: That particular plotting snafoo occurred because I didn’t have a firm plan for where the novel was going when I started it. Normally I have a strict chapter breakdown before I’ve written a word. Needless to say, I won’t be ‘pantsing’ again. Q: What made you choose fantasy, and particularly the blend of high meets grimdark (highdark?) in A Demon In Silver, as your means of expression? I’ve always been a fantasy fan, probably due to the freedom of expression it gives. You’re not tied down to a real time or place and are free to come up with whatever background you like. Also, I’ve always found that despite their ‘otherworldly’ settings, fantasy novels are essentially about people and character, as opposed to SF, which usually seems to be about high-concepts and ideas. I’m all about the characters. Q: Speaking of high fantasy meets grimdark, I see that you’ve also written short stories set in the Warhammer and Pathfinder universes. Are you much of a role player, and how does that inform your writing, if so? A: I used to work as an editor for an RPG company back in the dim and distant, and I have been known to roll the odd funny shaped die. I don’t take much influence from roleplaying, as the traditional adventuring-party concept doesn’t really fit in with the kind of books I write. However, I love a look through a setting guide every now and then, and find them a great source of inspiration. Q: Are there any new books or authors in fantasy that have you excited? A: I’m currently reading The Court of Broken Knives by Anna Smith-Spark and liking it a lot. I’ve also heard some very good things about Blackwing by Ed McDonald so I’ll be picking that up at some point and most likely adding it to my ever expanding to-be-read pile. A: As we speak I’m thrashing out book two in the War of the Archons series; The Hangman’s Gate, while I also dream about the other projects I’d love to write if only I had the time. 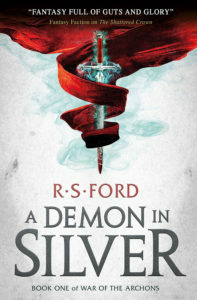 A Demon In Silver was published June 12th 2018 and is available via all good book sellers. My review of the book itself may be found here.